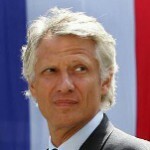 Dominique de Villepin is the former Prime Minister of France, between 2005 and 2007. Following a career as a diplomat he became renown throughout France and the rest of the world for his views on peace and justice. He was a leader in promoting a policy of multilateralism through global governance. He was also active in reform for both French and European global policy. Skills developed during his years in the diplomatic service and as Minister of the Interior enabled him to confront the issues of the underlying aggression in the French suburbs leading him onto dealing with the battles of Africa and the Middle East. Not deterred by the level of conflict or popularity aspects he used such strategies as calling a state of emergency in 2005 to deal with some of the problems faced by France at the time. He was a champion for the people working to provide solutions for unemployment realising a reduction of approximately 20% during his time in office. Having been born in North Africa and spending his early years in South America enabled him to have a wider perspective on both continents with an ideal of promoting further understanding and developing a unity between the two. An active writer he expanded on his ideas for a vision of man in a diverse environment searching for solutions to maintain cultural identities within a common ground. A man with vision, he can bring not just experience but thoughts for the future from a context of intense thought and deliberation. Dominique de Villepin speaks French, English and Spanish.